From a chorus of politicians, whether Obama or Hillary or Bernie or Trump, we hear alarm about our “crumbling infrastructure.” This rhetoric receives amplification from the interest groups that benefit most directly from spending on infrastructure, i.e., labor unions, civil engineers, general contractors, suppliers of raw materials, and manufacturers of heavy equipment. Which is as it should be in a democracy. Vested interests are supposed to agitate on their own behalves. Rather more distressingly, the allegations of crisis coming from politicians are routinely accepted without question in the media. Assertions about the deficiencies in our infrastructure and the benefits of spending are treated as articles of faith in columns, interviews, and debates. Likewise, dubious schemes for financing the proposed expenditure are taken without debate as to their appropriateness or effectiveness. Which, of course, is not as it should be in a democracy. The press is supposed to exercise an informed skepticism on topics of public importance. As but one example of the media failing its responsibilities on this issue, consider the abject complacency of the panelists on MSNBC’s Morning Joe when Bernie Sanders declared to them in January that we need one trillion dollars of new spending on infrastructure, seemingly to be funded through punitive taxes upon the billionaire class. Or the claims by Donald Trump on the show that our roads and bridges are “a disaster,” and we need to build monumental airports like those he has seen abroad. 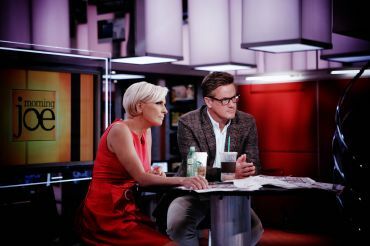 The reaction of the highly intelligent and normally sensible Morning Joe hosts was unconditional surrender to these allegations and propositions. Indeed, in the interview with Sanders, the conservative Joe Scarborough managed only to bemoan the condition of his own regional airports. Which is to say that when presented the opportunity to question a bold proposition from a leading candidate to be president of the United States, Scarborough instead indulged his own parochial concerns, effectively becoming a fellow traveler in the cause of massive new spending on infrastructure. What is the case for crisis? Powerful support for the alarmists comes from images of congested freeways and rusted ironwork. It comes from stories about the rare train derailment or bridge collapse. It comes, too, from mercifully infrequent tragedies such as the one that has befallen Flint, MI, in regard to the community’s water supply. Images and events such as these remind us of the vital importance that infrastructure plays in our lives; of the risks incurred when lawmakers fail their duties and public agencies fail their missions. This anecdotal evidence does not, however, prove that a nationwide emergency is upon us. It does not tell us the types of problems that are most severe; the amount of spending that is worthwhile; the processes by which projects are to be selected and delivered. For these questions of policy, we need to look at relevant data, historical experience, and expert opinion. And especially for infrastructure, we need to consider the return on the money invested. As their evidence of a crisis, the alarmists are fond of a quadrennial report card from the American Society of Civil Engineers (ASCE), who in 2013 issued a D+ for the overall condition of our infrastructure. Hillary Clinton, as but one prominent example, cites this D+ as her foremost justification for “dramatic” increases in infrastructure spending. Unfortunately, while the ASCE report card deserves an A+ as a piece of public relations, it merits its own D+ as a guide for policy due to failure to explain the benefits to be realized from the trillions in new spending urged by 2020. More specifically, the report card promotes engineering standards to be attained for our infrastructure but does not explain the financial benefits to be realized from the expenditure. Its methods being suspect and its motives being political, the popular ASCE report card needs to be treated with skepticism. Likewise with certain data from the Federal Highway Administration (FHWA), which allegedly should inspire worry. The data, which are rarely given proper understanding, indicate that 18 percent of our roads are below acceptable condition and 21 percent of our bridges are either functionally obsolete (16 percent) or structurally deficient (5 percent). The spin from the alarmists is that bridges in particular require heavy spending. The reality is different. Most obvious, these numbers indicate that approximately 80 percent of roads and bridges are in acceptable or good condition, which might not be optimal but is not a dire crisis. More important, the data indicate neither that our bridges are on verge of collapse nor that our spending is grossly deficient. 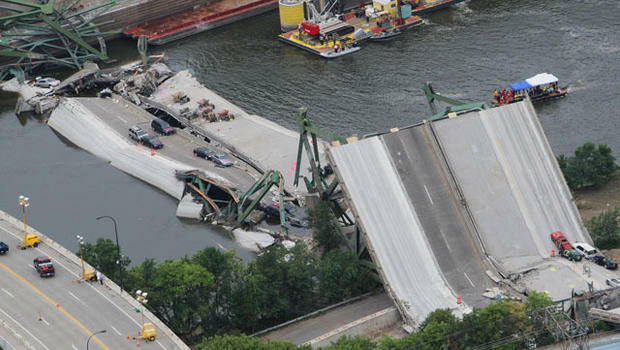 As with the ASCE report card, the FHWA data on highway and bridge conditions indicate only a gap relative to recommended engineering standards at a particular snapshot in time. 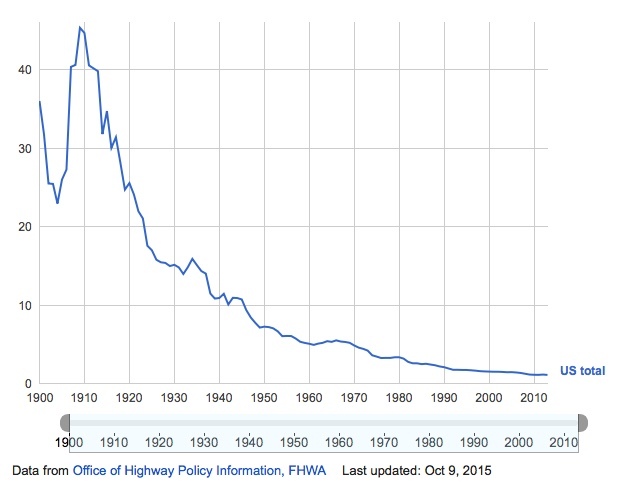 As the FHWA summarizes it: “A bridge rated ‘functionally obsolete’ or ‘structurally deficient’ is not necessarily unsafe. Rather, it typically has an older design that lacks modern safety features such as adequate shoulder space, an appropriate railing system, or other features.” Such deficiencies are not to be dismissed. But they are not be taken as justification for trillions in new spending, either. The point here is that physical conditions alone do not tell us what to spend, due to the fact that an improvement in engineering standards will not necessarily yield a positive financial benefit. Not only that, but the physical conditions themselves are not actually as bad as is typically portrayed in dramatic images; as is typically alleged in alarmist declarations. For highways and bridges, the physical conditions are actually quite respectable, as indicated above and discussed further below. As another tactic to support their claims, the alarmists frequently point overseas, especially to the Pacific Rim countries. Hillary Clinton, for example, points to China as an example of a nation that is “racing ahead” with projects that will “drive commerce and growth in the 21st century.” Donald Trump yearns for cathedrals of transportation such as those he has seen in Asia. Others lament reports of the U.S. not being ranked in the top echelons in the world for its infrastructure. Such arguments fail to account for differences across countries in terms of the opportunity for productive investment. The U.S. does not have the population densities that prevail elsewhere, making transit less appropriate here than elsewhere. We are not a developing country, lacking basic works for public health. And we are not an industrializing economy, building first-generation roads, tarmacs, and ports. We are not even the same country today as we were a few decades ago. We must therefore remain calm when we hear that our infrastructure ranking is 14th on some international study; that our infrastructure spending as a percentage of GDP was lower from 1992 to 2011 (2.6%) than it was for China (8.5%) per some report; that our own transportation and water spending as a percentage of GDP was lower in 2014 (2.4%) than it was in 1959 (3.0%), according to some government agency. The rankings in the comparative studies might be justifiable, and the metrics in the reports might be accurate. They do not, however, tell us what we should be investing today in response to our own particular circumstances (which include worrisome levels of public debt). 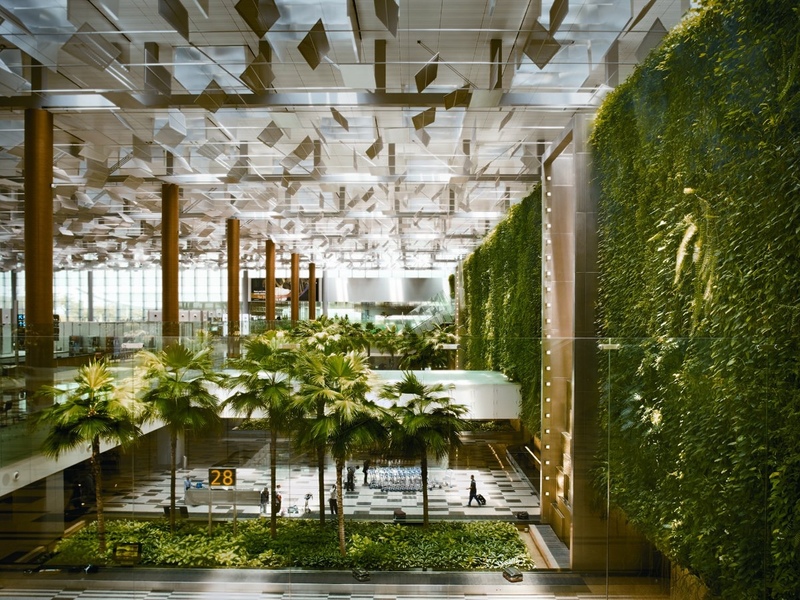 Moreover, we are not a country newly arriving onto the world stage, seeking status via public statements such as the Singapore international airport, with its sleek architecture and luxurious amenities, which include “movie theaters, a multimedia entertainment deck, spas, and a wild corkscrew ride.” While we can surely take lessons from the reported operational efficiencies of such airports, we should not aspire to their opulence, as the new World Trade Center Transportation Hub should remind us. Likewise, we should be especially suspicious of comparisons to China and Japan, both of which are frequently held as paragons of infrastructure investment; both of which are actually exemplars of inefficiency and waste. In China, the spending is now widely seen to be yielding low returns and has been described as an outright binge in publications as philosophically diverse as The Atlantic and The Economist . 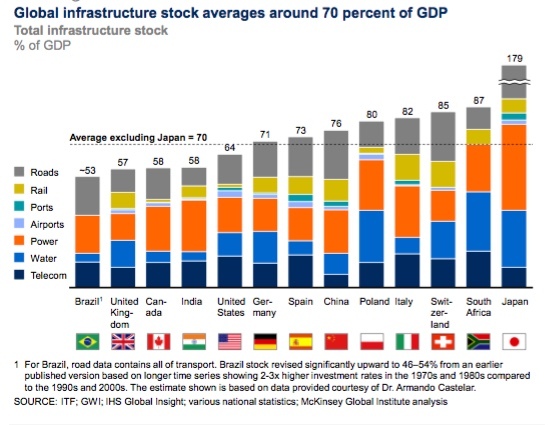 In Japan, as stated in the McKinsey study embraced by Clinton herself, “growth over the past 18 years would have ‘justified’ infrastructure investment of around 3 percent of GDP, but the country actually spent 5 percent.” For both of these countries, infrastructure decision-making that is overly centralized and overly politicized is yielding results that disqualify them as models for our own policy. The point here is that we need to be wary of simplistic comparisons of our spending to that in other countries or times. We need to focus instead on the returns we can expect from investment in our own projects and times. For all of the foregoing reasons, we need to be skeptical when we hear alarms about an infrastructure crisis. 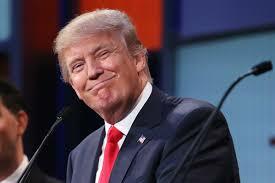 We are not, in fact, confronting a “disaster,” as Donald Trump has declared, with “67 percent of our roads and bridges in trouble.” Such was his allegation immediately after the New Hampshire primaries, again on Morning Joe and again without question from the show’s hosts. Our politicians need to temper such claims. And our media need to challenge them. How do the alarmists propose to pay? The alarmists, as we’ve seen, exaggerate our problems. Frequently, they advocate questionable financing strategies as well. Their proposals range the potentially helpful to the utterly irresponsible. A national infrastructure bank (NIB) is a popular recommendation that is not necessarily a bad idea. As summarized in a blog post by Robert Poole some years ago for Reason, the case for an NIB depends upon its mandate, practices, and size. If chartered to tap pools of private capital that seek to invest in projects backed by user-paid fees (e.g., tolls on roads), then the NIB would indeed be functioning similar to a bank and could play a helpful role in addressing needs. In this form, which typically involves public-private partnerships (PPPs) for large projects, the NIB might indeed be a modest source of sustainable investment that otherwise would not be available for infrastructure. If, however, chartered merely to extend grants, guarantees, credits, and bonds in defiance of sound banking principles, then the NIB would merely be an engine for accumulating obligations to be borne by the already overburdened general fund. It would be a device for deferring hard decisions about our country’s priorities and wherewithal. The difference is crucial. Most proposals, including those from Obama in the past and Clinton in the present, follow the irresponsible approach. With allusion to banks and the illusion of discipline, these proposals offer only the mirage of fiscal responsibility. Worthy proposals insist instead on payback of loans from revenue streams generated by user fees, as is the practice within any legitimate bank. Though they receive little attention, bank-like programs already exist. As noted in the Reason post, “in transportation, we have TIFIA, Private Activity Bonds and State Infrastructure Banks, and in wastewater there are State Revolving Funds. All of these are intended as self-sustaining activities, in which revenues from the funded projects pay back the loans, which enables new projects to be funded.” These programs can serve as either a model or a substitute for NIB proposals. Either way, they deserve consideration for modest expansion. Infrastructure, however, should not be paid from income taxes upon individuals and corporations. Infrastructure should instead be financed by fees on those who use the works, which is an approach that promotes fairness; creates dedicated revenue streams; encourages effective management; and aligns supply with demand over time. Modest subsidy from general funds can be appropriate to account for benefits to the general populace that arise from public-works projects (i.e., the public-goods effect). But to propose that general taxes should fully pay for infrastructure, as Clinton does, is to indulge in politically popular but fiscally irresponsible shenanigans. When pundits and voters fail to raise questions against such proposals, they contribute to the national failure to arrive at sustainable solutions to our infrastructure challenges. The current state of the Highway Trust Fund illustrates the hazards of politicized infrastructure policy. In past decades, the main criticism of public works was the prevalence of pork-barrel projects with little economic justification. The greater problem today is debt-financed expenditure caused by lawmakers evading their fiscal responsibilities. 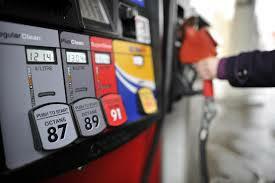 Since its inception in 1956, the federal highway program has been financed via the so-called gas tax. The goal was for those who used the roads to be the ones who paid for them (i.e., the “user pays” concept). The revenues from the gas tax flow to the so-called Highway Trust Fund, which finances both construction projects and maintenance activities for roads, bridges, and transit. Unfortunately, lawmakers have not increased the gas tax, which really ought to be regarded as a user fee, commensurate with transportation needs and general inflation. Instead, they have let this federal fee remain constant since 1993 at 18.4 cents per gallon of gasoline and 24 cents per gallon of diesel. If these rates had been pegged to inflation, they would have risen by roughly 60 percent by now, which would have been more than sufficient to fund legitimate investment opportunities in our road and transit systems, even after accounting for changes in driving habits and vehicle efficiency. The problem is not merely that lawmakers have allowed fees from the gas tax to stagnate. They have also allowed expenditures to continue grow. The result has been a shortfall in revenues relative to costs for the mis-named “trust fund.” To keep the “fund” solvent and the projects flowing, congress and the president have resorted to budgetary subterfuge. Which is to say, we do not actually need novel financing schemes for infrastructure. We simply need for lawmakers to meet their responsibilities toward the programs already in place. And for the media to encourage them to do so. One more habit of the alarmists is to argue that infrastructure spending creates new jobs and provides economic stimulus, so we need not be concerned with how it is financed. The argument is that when we spend $1.00 on infrastructure, we obtain, say, $1.50 of benefits due to multiplier effects. The proposition is questionable. Why government spending on waterways instead of private spending on computers? Why, for that matter, government spending on infrastructure, which according to one widely cited study adds $1.57 to the economy, when according to the same study, government spending on temporary food stamps will add $1.73? Why not, as Keynes reputedly suggested, pay workers to dig ditches, then to fill them back up, as a means of stimulating the economy? The more we spend, the better we are. The point here is that Keynesian arguments about jobs and stimulus are probably wrong and certainly debatable. If politicians and pundits want to redistribute income or incur debt on behalf of politically favored constituencies, picking winners and losers in the economy, they should be required to say so. If they advance fanciful stories of self-funding policies that are exempt from the dictates of budgets and the consequences of profligacy, they should be challenged. What is the state of our infrastructure? Our infrastructure is not in fact falling apart. It is generally in acceptable condition, with investment levels and physical conditions holding steady and even improving across recent decades. Deficiencies do exist, and tragedies do occur, but a disaster is not about to befall us as a nation. Safety on our roads and bridges is, for example, a remarkable success story. Due to the campaign against drunk driving, advancements in vehicle safety, and improvements to road safety, the number of fatalities per million vehicle miles is at an all-time low. The progress over the years is stunning. 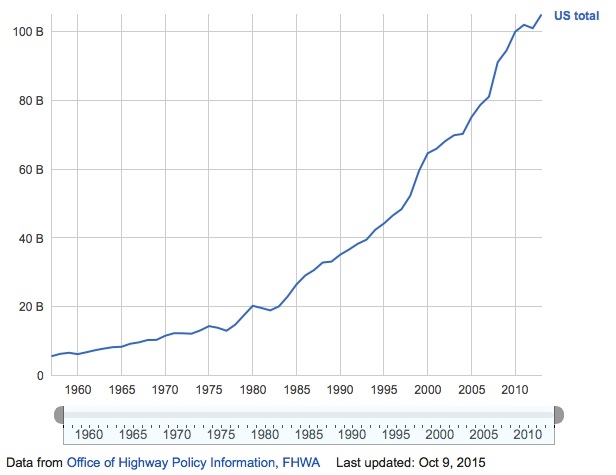 Likewise, public spending on infrastructure is consistently climbing, as evidenced below by an FHWA summary of total public capital spending on highways. The result is that our capital stock, which is a key metric in the McKinsey report that Clinton endorses, is consistent with benchmarks for industrialized countries. We are lower than some, higher than others, but not at a level that indicates a need for trillions of dollars of new spending. All of which makes it unsurprising that the opportunity for productive investment in roads, for example, is actually quite modest. 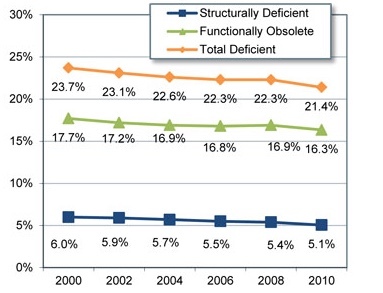 As summarized by the FHWA, “constant-dollar spending growth of 3.95 percent per year would suffice to finance all potentially cost-beneficial capital improvements on Federal-aid highways by 2030.” In other words, the opportunity for productive investment in roads begins to disappear at spending levels that are a mere four percent above current levels. The foregoing metrics and charts are far from comprehensive. They demonstrate, however, that a calamity is not in fact upon us. Yes, we need to spend more than we do at present. But not by orders of magnitude. And not without changes to the ways by which we select, finance, construct, operate, and maintain our public works. What policies should be adopted? We need, in other words, to do a little more, a little better. Which might not make for exciting political rhetoric but will put us on course for a satisfactory and sustainable infrastructure. The key is a multi-prong strategy that stabilizes funding, shifts priorities, leverages private capital, and adopts proven management techniques. 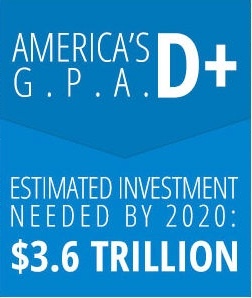 The opportunity for productive investment in new infrastructure projects is limited. As already mentioned, the FHWA estimates that for the road system, an annual increase of a mere four percent in spending would bring steady improvements in conditions and congestion. Any spending above that level would yield negative returns. Thus, instead of doubling or tripling expenditures, lawmakers should calibrate user fees to cover the costs of productive investment, then index the fees to inflation, so that they do not stagnate due to political pusillanimity, as has happened with the gas tax since 1993. This simple principle (i.e., calibrating for productive returns and indexing for inflation) would bring solvency to the payment pools for infrastructure, including the so-called Highway Trust Fund. It would keep spending at sensible levels. And it would promote user-pays finance. Might subsidies to account for public-goods effects be warranted? Yes, as long as they remain modest subsidies. Might innovative fees, such as a vehicle-miles-travelled tax (VMT), be desirable? Again yes, though it is hard to see how a VMT would be any less subject to political wrangling than the gas tax has been. Might downsizing the federal agencies and relying more heavily on the individual states be advisable? Yes, but again, the principles of indexed fees and productive investment would need to prevail. All of these proposals are worthy ideas. 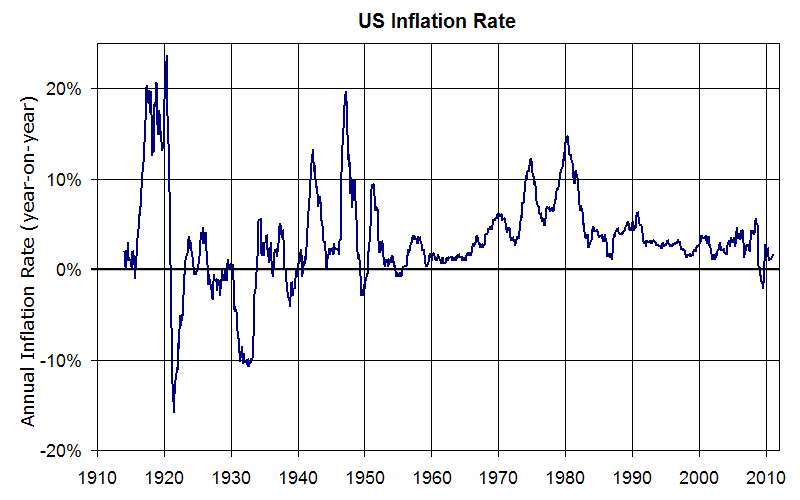 The key necessity and common theme is to reduce the impact of politics on rate-setting. The type of spending matters as much as the amount of spending. And in the U.S., the type of spending that offers best opportunity for positive returns is spending on maintaining conditions and optimizing the usage of existing infrastructure. 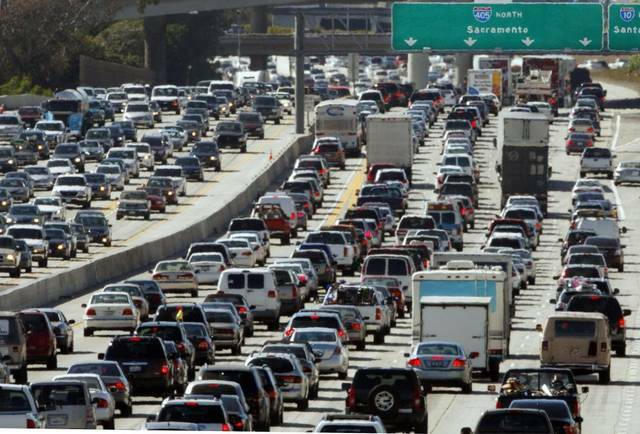 Congestion is a problem that has been subject to a similar political bias. In this case, the bias has been toward expensive transit projects that seldom meet projections for ridership and returns. To reduce congestion, policymakers should instead pursue methods for optimizing the use of the capacity already in place. These methods include adoption of new pricing models, improvement of incident management, and optimization of traffic flow. The impact can be substantial. The point here is that, instead of merely increasing spending, lawmakers can bring about substantial improvement in conditions and congestion by shifting priorities toward both better maintenance and better use of the capacity already in place. Besides shifting priorities for governmental agencies, lawmakers can also leverage private capital and promote private-sector management practices. 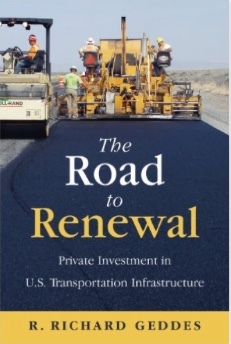 Public-private partnerships (PPPs) are the model for bringing private capital to public works. PPPs do not require establishment of an infrastructure bank but are the expected means by which any such bank would lend its money and execute its charter. We must adopt private-sector governance models and management practices. Clinton and her advisors seem to have missed these points when they read the McKinsey report, which does not mean what they think it means. Of all the problems besetting the country and receiving national attention, infrastructure might be the most straightforward to comprehend. Our facilities are not in fact crumbling. They are generally in acceptable condition with only modest opportunity for productive investment beyond current levels of spending. Our infrastructure requires better management at least as much as increased expenditure, with an insistence on positive returns on investment and enforcement of the user-pays principle. Where practicable, though not as a panacea, facilities should be entrusted to public-private partnerships (PPPs), perhaps in conjunction with a national infrastructure bank that operates according to proven banking principles. All of which is to say that alarm is not warranted. Infrastructure is a problem for which a combination of measures, including modest increases in spending, will deliver an efficient, safe, clean, and affordable policy. We need for politicians and the media to come to this realization. When candidates proclaim a false crisis, and lawmakers practice budgetary gimmicks, they fail us. When the media decline to exercise skepticism or question assumptions, they fail us, too. And when we as citizens accept these failures through our voting behavior and viewing habits, we are complicit. 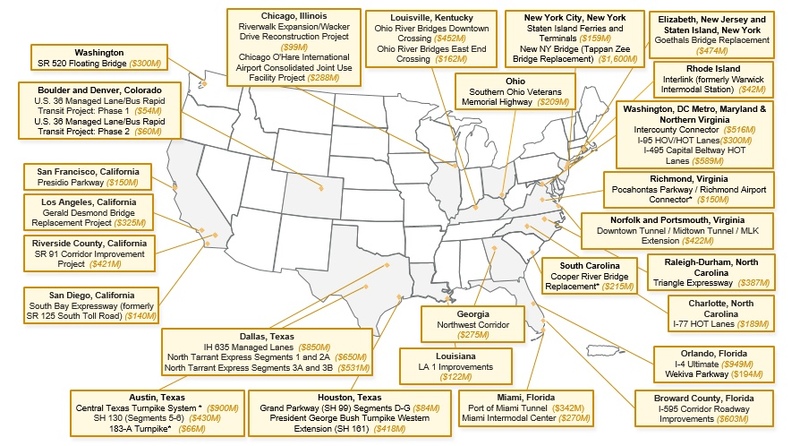 ASCE Infrastructure Report Card: A quadrennial assessment of the nation’s infrastructure from the American Society of Civil Engineers. Hillary Clinton’s Infrastructure Plan: Proposal from the Clinton presidential campaign for increased spending and a national infrastructure bank. A New Strategy for America’s Highways: Paper from the Brookings Institution proposes new strategy summarized as, “Fix It First, Expand It Second, and Reward It Third.” First, devote federal gas taxes to maintenance activities. Second, create a Federal Highway Bank that requires benefit-cost analysis to demonstrate the efficacy of a new build. Third, provide an interest rate subsidy from the Federal Highway Bank for agencies or programs that deliver benefits in excess of projections. The Road to Renewal: Study from the American Enterprise Institute and Professor Richard Geddes of the Cornell Institute of Public Policy, arguing that public-private partnerships (PPPs) can halt the deterioration of America’s transportation system and become the foundation for a safer, more efficient transportation future. Demonstrates how the economic principles behind supply, demand, competition, and incentives can bring about such results. Public Spending on Transportation and Water Infrastructure, 1956 to 2014: Report from the Congressional Budget Office (CBO) providing information on spending by federal, state, and local governments for transportation and water infrastructure. The Highway Trust Fund: Report from the Congressional Budget Office (CBO) addressing the imbalance in the Highway Trust Fund and issues with budgetary control.